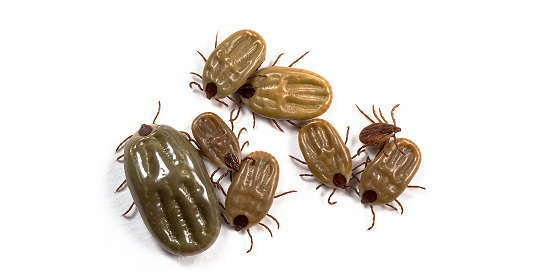 Ticks are the small wingless external parasites, living by hematophagy on the blood of mammals, birds, and occasionally reptiles and amphibians. Ticks are blood-sucking parasites that are often found in freshly mown grass, where they will rest themselves at the tip of a blade so as to attach themselves to a passing animal. It is a common misconception that the tick can jump from the plant onto the host. Physical contact is the only method of transportation for ticks. They will generally drop off the animal when full, but this may take several days. Ticks have a harpoon-like structure in their mouth area, known as a hypostome, that allows them to anchor themselves firmly in place while sucking blood. This mechanism is normally so strong that removal of a lodged tick requires two actions: One to remove the tick, and one to remove the remaining head section of the tick. Ticks are important vectors of a number of diseases. Ticks are second only to mosquitoes as vectors of human disease, both infectious and toxic. Hard ticks can transmit human diseases such as relapsing fever, Lyme disease, Rocky Mountain spotted fever, tularemia, equine encephalitis, Colorado tick fever, and several forms of ehrlichiosis. Additionally, they are responsible for transmitting livestock and pet diseases, including babesiosis, anaplasmosis and cytauxzoonosis.